The high-gloss lacquered Poggenpohl cabinetry extends along the perimeter of the room similar cabinetry forms a low storage unit for audiovisual equipment at the far end of the wall. Just about everyone in New Zealand has a happy memory of a summer holiday in a small fibrolite bach near the water. It never seemed to matter that these homes were uninsulated, with just a few basic amenities. But fast forward a few decades and the appeal of the primitive is not quite as endearing. When a few home comforts and more space were required for this family bach, the owners decided they were too attached to the original fibrolite building to demolish it, so they pushed it out instead. An extension was added to the northern end of the bach and a new monopitched roof installed over the entire building. "There was considerable talk about replacing the small windows and cladding," says one of the owners. "But we didn't want to disguise the building's origins. Rather, we felt we should clearly differentiate the old part from the new." With this in mind, the design team retained the look of the original bach, replacing rotting wood windows with exact copies where necessary. 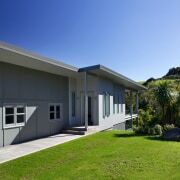 This part of the house was then painted in dark-grey Resene Gravel, while the new extension was painted in the lighter shade Resene Half Gravel. This 1950s bach has undergone a major transformation to create a spacious, light-filled holiday home on two levels. The darker grey colour is repeated in a new honed, stacked concrete block wall on one side of the extension, providing a subtle visual link between front and back. 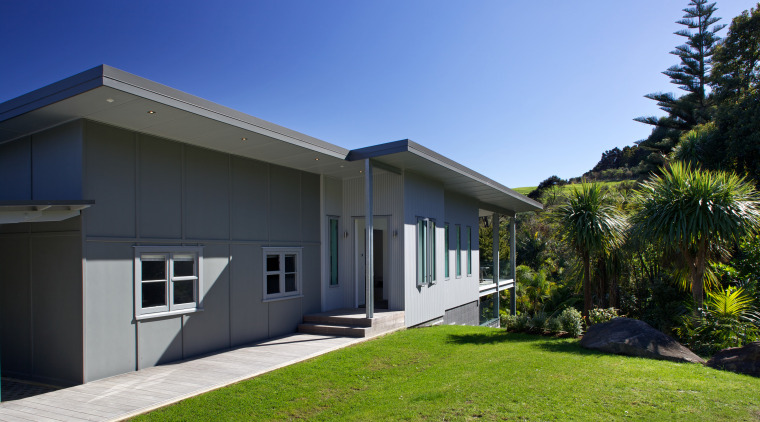 "The new part of the house is also clearly differentiated by its structure," says the owner. "We have left the steel structural columns and framing exposed at the north end of the house, which is now two storeys high, with a large, elevated covered veranda. The galvanised steel has not been painted or powdercoated." The aluminium joinery is also very different from the original wood. On the east side of the house, the windows are tall and the weatherboards are vertical. While on the west side, the windows are long and narrow and the weatherboards run horizontally. 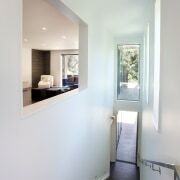 To provide a sense of substance, the walls of the new part of the house are 25cm thick. This creates deep reveals for the windows and a large cut-out in the stairwell, which brings the morning light into the living area. A new Poggenpohl kitchen, designed by Lara Farmilo, is another key aspect of the build. The kitchen features reflective high-gloss lacquered cabinets in Pebble Grey. These are teamed with white pine decor panels along the top drawers of the island and perimeter base cabinets, which provide a textural contrast. The original bach is clearly differentiated from the new extension. It is painted a darker shade of grey and features small wood-framed windows. A new boardwalk runs from the carport to the front door of the house, in the extension. This end of the house is elevated by 30mm to accommodate new rooms on the lower level. Water tanks are also concealed beneath the house. "The pulls are concealed to keep the look very sleek and clean lined," Farmilo says. "And because this is an open-plan living area we have concealed the appliances by integrating them into the cabinetry wherever possible. 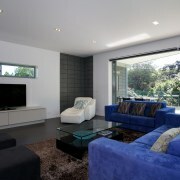 The two ovens are in the side cabinetry, so they are not too visible from the living area." Another feature of the kitchen is the deep island top. 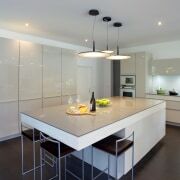 The 12mm Silestone benchtop sits on a steel-reinforced cantilevered extension that doubles as a bar area. "The kitchen is large enough to cater easily to a holiday crowd," says the designer. 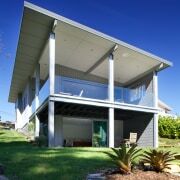 "And there is ample storage, which is essential in a beach house." The extension has provided a new master suite on the lower level. This has the exact same outlook as the original bedroom in the bach. "We have kept the existing rooms in the bach also," says the owner. "The former kitchen is now a kitchenette, and there is a guest bedroom and bathroom. 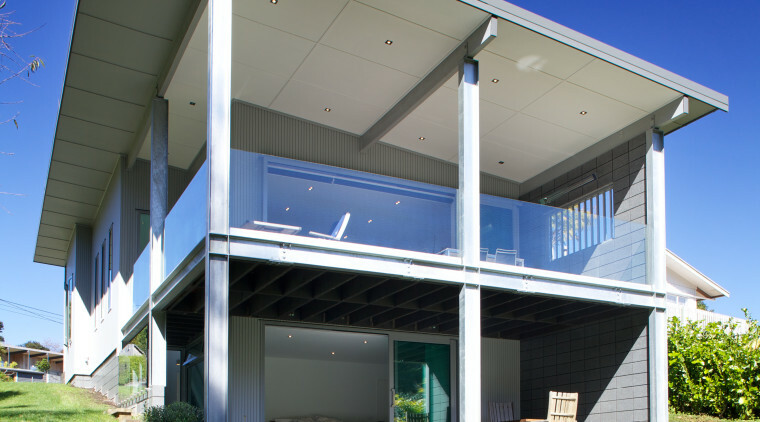 This part of the house can be screened off by a large sliding door in the end wall of the kitchen, which provides privacy for guests if required."